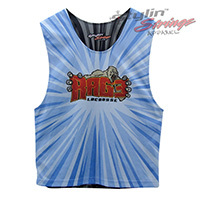 The Rage sublimated lacrosse reversibles are one of the most creative designs we have done. The custom gorilla loga was hand drawn and then transferred into illustrator. The blast style background gave the design depth and perspective. This Battle Creek Michigan client was extremely happy.